When I submitted my complaints about claims made on chiropractic websites in June 2008, a fundamental requirement regulating what chiropractors could claim — firmly embedded in their Code of Practice — was that they only advertise consistent with guidance issued by the Advertising Standards Authority (ASA). Chiropractors must justify public trust and confidence by being honest and trustworthy. C1 Chiropractors must act with integrity and never abuse their professional standing. 29 For example, by arousing ill-founded fear for their future health. This clearly mandates chiropractors to ensure any advertising complies with ASA guidance, remembering that ASA guidance includes the CAP Code, other guidance and their adjudications. In prosecuting my complaints, the GCC inexplicably forgot all about the requirement to be consistent with ASA guidance and came up with some arbitrary standard of evidence for compliance. The Professional Conduct Committee begged to differ even with that and effectively allowed any old evidence to be used to substantiate chiropractors’ claims. To understand the whole story, see Humpty Dumpty regulation. In a process that took a while (as these things do), that CoP was re-written after a consultation and a new Code of Practice came into force on 30 June 2010. The GCC sent out their consultation on this document in September 2008, some nine months before my complaints. Achieving the requirements set out in the Code of Practice and the Standard of Proficiency will deliver a standard of chiropractic care that will promote patient health and wellbeing, and protect patients from harm. These requirements are laid out in the left-hand column in the following pages. The right-hand column gives guidance and advice to help chiropractors meet these requirements and provides links to further information, including details on where the content of further legislation can be found. The guidance is not exhaustive. Chiropractors must keep to all the standards within the Code of Practice and the Standard of Proficiency, including complying with all related legislation. 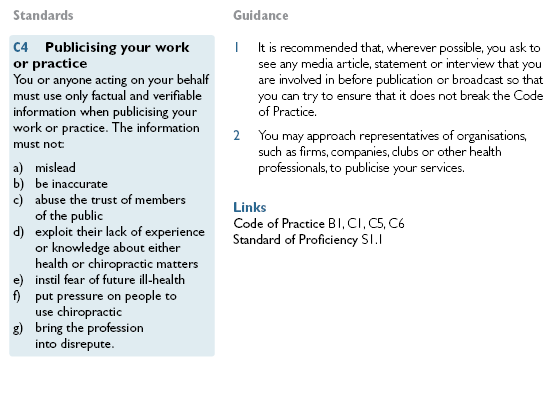 There is no further information given as to whether compliance with the ‘guidance and advice’ of the right-hand column is mandatory or whether a chiropractor can choose to completely ignore it. 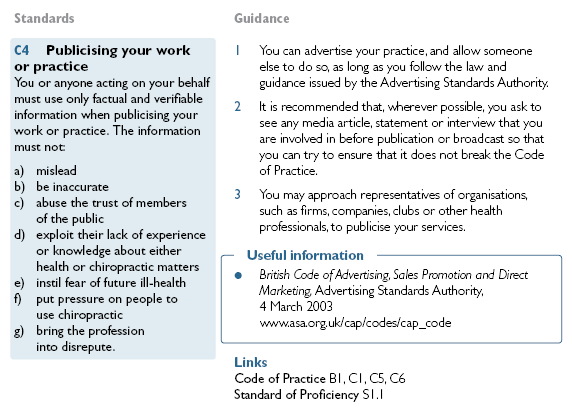 So, the requirement to follow the law and ASA guidance has been relegated to ‘Guidance’ instead of ‘Standards’ and it would appear that chiropractors can ignore that ‘Guidance’ and the pesky ASA guidance. But it looks as if even this was too much for chiropractors. Yet another new version of the CoP appeared on the GCC’s website on 22 December 2010. It’s difficult to tell that it’s different because it’s got the same title, same file name (COPSOP_2010.pdf) same implementation date in bold letters on the front cover and exactly the same ISBN number. No hint that anything had changed. Just what you’d want to do if you didn’t really want anyone to notice what you were up to. But the metadata in the pdf shows it was modified on 20 December. You can advertise your practice, and allow someone else to do so, as long as you follow the law and guidance issued by the Advertising Standards Authority. So now chiropractors don’t even have the ASA’s guidance to help them when they try to decide what they can and can’t advertise. I wonder what forced them to change their minds (again) and delete the guidance? You are urged in the strongest terms to use the report and its evidence summary tables to review the content of your printed advertisements, practice leaflets and any website that publicises your practice, to ensure compliance with section C4 of the GCC’s Code of Practice and Standard of Proficiency: effective from 30 June 2010, the relevant law and guidance issued by the Committee of Advertising Practice (CAP) – the sister organisation of the Advertising Standards Authority. You are urged in the strongest terms to use the report and the tables to review the content of your printed advertisements, practice leaflets and any website that publicises your practice, to ensure compliance with section C1.6 [sic] of the GCC’s Code of Practice, the relevant law and guidance issued by the Committee of Advertising Practice (CAP) – the sister organisation of the Advertising Standards Authority. So although no longer mentioned in the CoP, ignoring ASA guidance doesn’t look like the sensible option. A few months ago, the ASA changed their guidance on what advertising claims they would allow for chiropractic. This will be the subject of my next blog post, but the new ASA guidance can be found here (free registration required). But just in case anyone thinks that the job is done and that no chiropractor would now openly advertise claims about conditions not supported by robust evidence should have a look at the results returned by even simple web searches for colic, ADHD, asthma, cerebral palsy, bedwetting and ear infections. It looks like there is more that needs to be done if the public are to be protected from misleading claims. The main change in this new version is the clarification of the difference between the standards in the Code of Practice and the Standard of Proficiency, and the guidance and information to help chiropractors deliver those standards. To assist in this, a new layout is being tested – this sets the standards which chiropractors must meet in the left-hand column of the page and guidance, information and links to further documents in the right-hand column. In addition the document has been updated to reflect any changes in legislation and guidance, and to capture more effectively the different settings in which chiropractors may work. An index has also been introduced to help chiropractors and others find their way around the different sections. “Urged in the strongest possible terms” but not actually in their Code of Conduct? Surely that means the GCC can “urge” while having put away any disciplinary stick with which to beat anyone who ignores such urging. Certainly “1st March” etc, but that only gave the ASA responsibility for the web. That doesn’t alter the fact that the GCC seems to have decided to sideline the ASA into the long grass of good intentions rather than keeping it within chiros’ non-negotiable professional obligations. It wasthe weight of real disciplinary force that gave your complaints potency. A decision is to be made about it at the next council meeting on 21st April. There seems to be an indiction the British Association are moving towards an evidence approach to chiropractic, a success then? I have looked at some websites and it seems that the concept of subluxation is used only in a historical sense. What confuses me is the difference between chiropractic and osteopathy as I understand there are differences in the advertising lists between them? Chiropractors, like anyone else, will still have to comply with the ASA’s standards. The changes made by the GCC in the Code of Practice have done nothing to change that. The GCC has no authority over the ASA. Therefore, the effect of the changes is simply that troublemakers can no longer complain to the GCC about non-compliance with the ASA’s standards. However, they are of course still free to complain to the ASA directly if they feel there has been a breech. Is that not enough? Isn’t that the stated intention of “skeptics”, to prevent the unjustified claims? Or are they disappointed because the ASA will only tell an advertiser to remove or amend their material rather than discipline the offender? I think that the initial stance by Zeno and friends was agenda driven eg Singh case, and they have openly admitted that but the outcome has been a positive one. More by accident than design I think, but positive never the less. As I have posted before, it is my understanding that both the ASA and other powers in governance are aware that some highly vocal members of the sceptic community, but not all I have to add and not in as many numbers as you would think and I put myself into the latter category, are using the ASA as their own personal police force against CAM. This itself has it’s problems and now that the orchestrated attacks come under the banner of the NC it is even more obvious. I think that things are due to change in a big way and as the ASA has never had a challenge in court. They seem to have different rules for one group over another where evidence is being used to dictate what can and cannot be advertised. They also seem fully aware that the attacks pre and post NC were and are orchestrated by agenda if some of the tweets are to be believed and this may possibly make them vulnerable in a court of law. Taking a different tack, I guess you are a chiropractor so my question is that having looked at the Bronfort report and the ASA listing of treatable conditions. Why is there such a large discrepancy between the listings of osteopathy, physiotherapy and chiropractic and why has your profession not challenged that. I read on another site, skeptic barista I think, where an osteopath has totally denounced the ASA listings for osteopathy as having no grounding in evidence at all, yet they continue to exist and osteopaths are allowed to use them in their advertising? Is there something I am missing here? I also note that osteopaths and physiotherapists can treat sports injuries and chiropractors can not. Do the three professions not treat musculoskeletal injuries but in a slightly different way? Surely this in itself must be good for the consumer as there is more choice. I appreciate that blue wode posted or tweeted somewhere that everyone should take the medical route and if that fails, rather than going anywhere else, the should just learn to cope with it???? My goodness what a pitiful statement and nothing to do with scepticism as I know it. I go back to my first statement with regards that there seems be an agenda here rather any attempt to wanting to protect patients, wouldn’t you agree? I also note that osteopaths and physiotherapists can treat sports injuries and chiropractors can not. Do the three professions not treat musculoskeletal injuries but in a slightly different way? You are absolutely right. All three professions do treat musculoskeletal disorders. Unfortunately for the punter, it is not easy to define the differences between the professions as there are often bigger differences between the individual practitioners. You are correct in assuming that I am a chiropractor and I can therefore only give you a chiropractor’s perspective. I have huge respect for the good physiotherapists and osteopaths that practice locally to me, but there is nothing in either of those two professions that cannot be found in chiropractic. My advice to people is always to check the qualifications and go on recommendation. You may be surprised to hear that I don’t always bang the chiropractic drum and I do believe that there are others that can do a good job of treating muscloskeletal problems as well as chiropractors. As for the ASA’s lists of various disorders that they are prepared to see advertised by the different professions, there seems to be no rhyme or reason to them. I think that they have grown around the various considerations that the ASA has made at various times on material they have had to look at. I understand that they have been asked to consider the Bronfort report but, as an independent body, and not the one that commissioned the report, they will be making their own judgements. I also understand that they have been asked to look at the issue of chiropractic and sports injuries and that we are awaiting a decision. You might have thought that, given the fact that musculoskeletal disorders are what we deal with, the marketing should be allowed to include the complete range. Otherwise, it’s a bit like dentists only being able to make claims for treating molars and not incisors. Oh, hang on! I suspect that there are very few, indeed I would venture no, RCTs that have established the efficacy of drilling and filling teeth. Perhaps Zeno might be tempted to make a bulk complaint about dentists………….. Thank you for answering those points. I think scepticism is healthy and I am sceptical about many things to include some brands of skepticism. I do however agree that if there is evidence it should be followed. I remember reading in my daily paper, so either the guardian or the independent, that doctors were asked if they followed evidence. If I recall rightly they said they did but it wasn’t as important as risk over benefit which was left up to the doctor to decide. This seems sensible as they have the training to do that. Do chiropractors? If I recall rightly they said they did but it wasn’t as important as risk over benefit which was left up to the doctor to decide. This seems sensible as they have the training to do that. Do chiropractors? Absolutely they do. The AECC where I trained runs a five year full time programme and one of the main feasons it takes that long to train chiropractors properly, apart from the length of time needed to aquire the skills, is that they are then equipped to know when and when not to treat a patient and what techniques to use. Is that 5 years part time or is that a different school. So how does your education compare if at all, with medicine? I presume you learn a about chiropractory but what else does it involve? I’m not sure what you mean when you say that you presume we learn about chiropractic. It’s important to understand the chiropractic is a profession, not a treatment. The training necessary to become a chiropractor involves the basic sciences you would expect in any primary healthcare profession, eg anatomy, neuroanatomy, embryology, physiology, neurology, biochemistry, orthopaedics, pathology, paediatrics, geriatrics, biomechanics, psychology etc. A large portion of the course is spent on general diagnosis, so that chiropractors can know when and how to treat their patients, as well as when to refer to another healthcare professional. If true then it sounds like you guys are well placed to treat patients and decide a course of care. What I don’t understand and what I meant by chiropractory, and I apologise that should have been chiropractic, is the subluxation thing everyone is going on about or are they deliberately over simplifying what you do. You may be interested to know that your General Council has just listed another batch of not guilty decisions over the website complaints? What I don’t understand and what I meant by chiropractory, and I apologise that should have been chiropractic, is the subluxation thing everyone is going on about or are they deliberately over simplifying what you do. There is a great deal of confusion about the “chiropractic subluxation”. Personally, I don’t use the term and never have in twenty five years of practice. One of the problems is that the word has a very specific meaning in orthopaedics which is “something less than a luxation”. A luxation translates into a “dislocation” and the term subluxation therefore describes a malpositioning that is less than a complete dislocation. The term is used by some chiropractors to describe the areas of dysfunction that they have identified in a patient. However, as you say, it is an oversimplification. One of the difficulties is that mechanical problems are generally quite complex in nature and to give a patient a proper understanding of their problem requires a degree of explanation that can easily go straight over their head. So, terms like “trapped nerve”, “pulled muscle” and “slipped disc” tend to get used which are also terribly simplistic and generally inaccurate. However, in the same vein, some chiropractors have adopted the term “subluxation” as a cover-all for problem areas. It has gained notoriety because, sadly, some chiropractors have been responsible for overstating the severity of a patient’s problems, telling them that they have multiple “subluxations” and prescribing unnecessarily extensive courses of treatment. This is a reprehensible failing of some irresponsible practitioners who deserve all that comes their way. But remember, that this is not a failing of chiropractic, only of some misguided individuals who hopefully are being weeded out of the profession as we speak. Although you may hear a lot about it on blogs like this, it is thankfully a lot less common than that suggests. So the confusion seems to come, at least in the UK, from your profession being kinda split into two camps? Reading around this, it seems that, like the osteopaths there are people with a traditional approach eg some standard osteopaths and the cranial guys and the others who treat MSk. You guys are the same, but the subluxation, rather than the osteopathic lesion, is used in both camps, but just describes a ‘mechanical type lesion’ is that right? What amazes me is that certain bloggers seem to deliberately lump all you all into one bag with no credence for those who are treating in a biomechanical fashion and who are obviously following some good evidence or the ASA wouldn’t have their list? This again smarts of agenda rather than scepticism. I can understand why the complaints were made with regards supporting Simon and hitting back as it were, but not why they were processed by your council, as the vast majority to date are being found not guilty. It seems a total waste of time and money and seems to vindicate your profession from the complaints themselves. You guys have taken down the kiddies stuff so I guess it’s a draw. But I think I read somewhere it doesn’t stop you treating children? I think if your profession has any sense, they will follow the ASA listing, work on improving robust research evidence, which can only improve your standing anyway. I think, staying within a like for like, it is the physiotherapists and osteopaths that may end up with more problems. There will always be those who just hate your very existence but I agree with other posters that society and many sceptics dislike bullies and intolerance and they will eventually be seen for what they are, and ignored. Will your profession split into two distinct groups or maybe that’s the case already ? Of course the answer may give permission for those who just want to destroy rather than push for evidence to suggest your profession no longer has substance or core values so shouldn’t exist. Maybe you won’t want to answer this? Secondly, with the amount of evidence available, why do you think that osteopathy and physiotherapy are not being attacked. Is it because the osteopathic profession has doctors in it, Still was a doctor ( so the NC doesn’t want to irritate the medical profession) or because they have better evidence than you? I find this whole thing fascinating and not as clear cut as some hiding behind the sceptic banner would want the rest of us to believe? Still without different opinions there would be no debate, and potentially no answers. Eh? Most have been found not guilty? Any idea why? No idea, it is on their council’s website. Is this them http://www.gcc-uk.org/hearings.cfm ? There’s thousands of them! Which ones are which? Yes, I had to look through them? But they are most of the not guilty ones if I remember rightly. I get the impression, reading the outcomes that they went through due process and they were found not guilty of unprofessional conduct. You sound disappointed that these people have gone through whatever protocol is required by their council and been found not guilty. Why? Eh? I’ve no axe to grind either way – why on earth do you think I sound disappointed? I’ve not had time to look at any of them but I’ll maybe have a look tomorrow. The GCC has been keen to be seen to be doing its job. I think there are those on Council who believe that referring these cases to the Professional Conduct Committee (PCC) was appropriate. However, there are many who feel that, in its attempt to be diligent, the GCC has lost its sense of proportionality. It seems to have been left to the PCC to exert a reasoned approach to the matter and, as you say, they have so far found the vast majority not guilty. Interestingly, for reasons best known to themselves, the GCC, who become the prosecutor in these cases once they get passed to the PCC, has done its best to manipulate the allegations in order to effect a guilty verdict on the remaining cases. You may have read that the GCC has recently announced the retirement of the Chief Executive and Registrar, Margaret Coats. There has been much speculation over the timing of this decision. You guys have taken down the kiddies stuff so I guess it’s a draw. But I think I read somewhere it doesn’t stop you treating children? What you need to remember is that the complaints relate to the level of evidence that exists for the claims that were being made for the various treatments being advertised. This does not relate to the effectiveness of the treatments, only the level of evidence available for that effectiveness. Now, please don’t misunderstand me, the claims that prompted these complaints were for the treatment of conditions that I don’t treat, eg infantile colic, asthma etc., but the point is that the failing was in the lack of evidence, not the lack of effectiveness. It’s true to say that if the same standard was held against all the treatments offered by “orthodox” medicine, many of them would also fail. Will your profession split into two distinct groups or maybe that’s the case already ? I don’t believe that there are two groups in chiropractic, I believe that there is one diverse group. 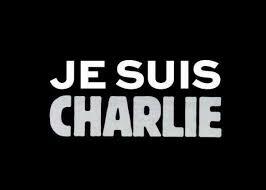 Some of them are, in my opinion, misguided and maintain beliefs that I find hard to support. However, the profession is clearly going through a process of change and I think that it will come out of this better, more unified and stronger. why do you think that osteopathy and physiotherapy are not being attacked. Is it because the osteopathic profession has doctors in it, Still was a doctor ( so the NC doesn’t want to irritate the medical profession) or because they have better evidence than you? Your guess is as good as mine as to why chiropractors have been targeted in this way. There are medical doctors in the chiropractic profession as well. I know of an orthopaedic surgeon who recently completed that chiropractic course at AECC. I work with local GPs and surgeons and there is no shortage of respect from those who actually know and understand what we do. Interestingly, when I contacted the ASA recently to ask them to review my literature, they made the comment that other professions make much wilder claims but have somehow managed to avoid the attention. Personally, I have no problem with being held to the relevant standard for any marketing material we might use. The information we make available to patients and the public is exactly that, information. When it comes to marketing, I’m happy to let results speak for themselves. When you do have that look, remember that the not guilty cases get taken off after a month and it is only the guilty ones that are left on the site. The outcomes you see will therefore actually be skewed more towards the guilty verdicts. I came to this debate, highly sceptical of CAM and to a certain degree I still am, more so for some professions than others now. I think that your responses have been honest and complete and don’t understand why some in the skeptical community are so hell bent to single chiropractic out for destruction. This blog where Zeno was a perpetrator of the complaints, is continually giving you flack, but I presume it’s because he was involved in the complaints against you and may feel that he should have had a far more devastating effect, I don’t know, that will be for Zeno to respond to. I must say based on what I read initially and before I realised that it was a retaliation in support of Simon, he had my full support. It seems he is also involved in the new NC which will pick a CAM a month to attack. Yet here the chiropractic thing just goes on and on, you have really upset someone out there I think. Any idea who? What I don’t understand is, going back over old posts here and elsewhere and now reading the CAM debate on twitter, that Zeno and other bloggers, even with the information that has been posted seems to want to promote that your profession is full of fraudsters and charlatans and this is obviously not the case. Any idea why? However in his defence I have read other chiropractic posters who are most certainly traditional in their values but even those people seem to suggest that the term they use for a biomechanical dysfunction, the subluxation, does not cure all ills. In fact if I have read it correctly the concept they promote is not a treatment of MSk but is a form of treatment which sets an environment to let the body heal itself. Now if those are the type of guys they dislike I think for a tempered debate, they should acknowledge that you guys are not all the same. That doesn’t mean I am suggesting those who use the subluxation as a mode if treatment are charlatans and fraudsters, although there seems very little evidence to support their stance at present. But that is the same in all professions and it should be recognised as such I think. After my research around the subject my opinion, on the main for chiropractic has changed, I would also urge others to do the same and make their own minds up. That doesn’t make me a supporter of groups not seeking evidence but I get the impression that your profession probably has as much evidence as any other healthcare group out there. I think you guys should thank Zeno and the others for highlighting holes but I get the impression that these are and will be filled. It takes time for stuff to happen and evidence to be gathered even from doctors. I read on another blog site that in one of my newspapers today is an article on a great deal of finances being spent on ineffective surgery. I haven’t seen it yet so i don’t know how true it is. So It seems that maybe even medicine gets it wrong sometimes. The reason I was surprised was that I was told last year by someone more knowledgeable than me that he expected most of the cases to be found guilty because (in his opinion) many chiros he knew were making ridiculous claims. It now appears he was wrong. Based on information I read here and on other sites I would have presumed the outcomes may have been different. My understanding now of course is a totally different picture and maybe the trumpets were blown too soon. Either way the positive is that hopefully advertising will be tightened in all areas of health care, if it isn’t it will make what has gone on in the past a bit one sided. I am a great believer that people with intellect think, those without just blindly follow what is said. As a sceptic I try to follow the former approach to life. I am glad I found this blog, it will be fascinating to watch how it is played out. This was a good and interesting read…. and I love this quote “I am a great believer that people with intellect think, those without just blindly follow “. I agree 100%!